the boat - a trident warrior 35 mK iii. Photographed off Preveza, Greece, July 2007. She is boat number 107 and her hull was moulded in 1977. She was built and certified to Lloyds 100A1, fully fitted by the factory in Portchester, England and launched in 1978. Engine Mercedes Diesel OM636 36 hp. 26 Kilowatts Fresh water cooled via heat exchanger. Angus Primrose, the designer was also responsible for the design of some 'Moody' yachts and Sir Francis Chichester's "Gypsy Moth IV". Angus tragically lost his life in 1980 when the Moody "Demon of Hamble" sank. 24th July 2006 - Re-launch day. Why the name "RHUMB DO?" My friend Sandra came down from Lincoln for a sailing weekend with me onboard Merlin II. 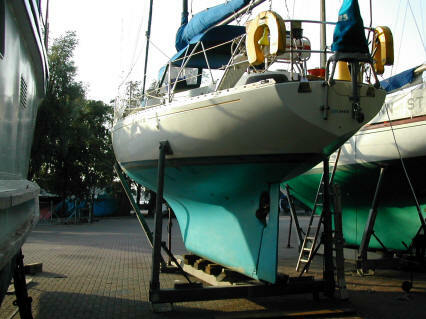 She quickly caught the sailing bug and made regular visits to learn more about sailing. When I bought this boat, I was having trouble thinking of a name for her and although I tried to think of something connected to the Solomon Islands (a favourite place), nothing came to mind. Sandra of course wanted to come down for a trial sail which we did in August 2006. Returning to the marina from that sail, Sandra suggested a sundowner but the boat was then unstocked, and there wasn't any alcohol onboard. When I gave her this bad news, she responded with "Well, that's a rum do," and I instantly thought "That's it!" Rum Do was a common phrase from my home county of Lancashire, so it seemed an appropriate name for the boat. I just altered the spelling a bit to play on the nautical side (Rhumb Line) and the boat had a new name! Sandra continued sailing by taking a course in the Caribbean. 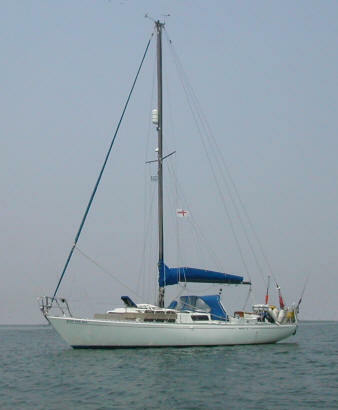 She now lives in Perth, Western Australia where she sails with the local club. An event that is disreputable or strange. There must be many more than those on Partridge's list as 'rum' could be used to precede almost anything, but the only ones to survive have the 'odd, perplexing' meaning. For example, 'rum do' and 'rum customer'. It could be, and this is speculation, that 'rum' migrated from simply 'good' and came to mean 'good at being bad'. From there it is a short distance to 'disreputable' and 'strange'.